SYOSSET, N.Y., Apr. 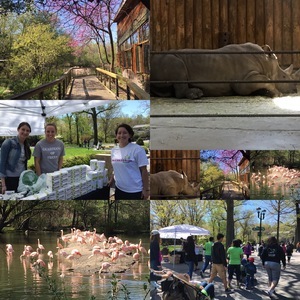 25 /CSRwire/ - In honor of Earth Day, Emerald Brand partnered with the Wildlife Conservation Society’s Bronx Zoo for Earth Weekend on April 23rd and April 24th to educate visitors on sustainability and global conservation. The Bronx Zoo Earth Weekend events produced public awareness about environmental protection and Emerald Brand proudly partnered with the WCS in this initiative. Emerald’s Brand Ambassadors educated visitors about alternative, environmentally-friendly materials such as sugarcane, bamboo, and eucalyptus that can be used in everyday paper products, rather than the traditional use of hardwood trees. Visitors were given goodie bags of Emerald’s products, and were encouraged to make minor changes in order to generate a huge environmental impact. Similar to Emerald’s mission, which is focused around global conservation and sustainability, the Bronx Zoo, a Wildlife Conservation Society Park, is dedicated to saving wildlife and conserving natural places worldwide through science, conservation action, education and inspiring people to value nature. Earth Day, annually held on April 22nd, is a globally celebrated holiday where events are held worldwide to demonstrate support for environmental protection and appreciation for the Earth. The Wildlife Conservation Society holds itself to the highest standards, adhering to core values of respect, accountability and transparency, innovation, diversity and inclusion, collaboration, and integrity. WCS saves wildlife and wild places worldwide through science, conservation action, education, and inspiring people to value nature. To achieve its mission, WCS, based at the Bronx Zoo, harnesses the power of its Global Conservation Program in nearly 60 nations and in all the world’s oceans and its five wildlife parks in New York City, visited by 4 million people annually. WCS combines its expertise in the field, zoos, and aquarium to achieve its conservation mission.